A word, if I may, about serendipity. After losing my job with the Gazette, I knew I wanted to keep writing about food. I love food, though my enthusiasm for it certainly waned under that publication’s bootheel. So I was overjoyed when radio/podcast mavens Scott and Kandyce Mitchell reached out about getting lunch. After all, I’d been planning to review Bryan Neel’s NoMa taco shop for a while. Why let unemployment get in the way? Sitting in the booth, dishing on the whys and wherefores and waiting on a truly ridiculous number of tacos to arrive, we were soon interrupted by the aforementioned Mr. Neel. Serendipity means “fortunate happenstance” and there was no happening more fortunate than this one. Not only was I able to review ALL of the restaurant’s margaritas, but since I wasn’t rushing to get back to an office (because all great journalism happens when you’re chained to a desk, /sarcasm) I could enjoy them in the manner all great margaritas deserve — totally and completely relaxed. For those who don’t know, Bryan is the “B” in S&B’s Burger Joints. He left that company in the capable hands of “S” (aka Shannon Roper) and went off to create something new. His first attempt is Hacienda Tacos and, goodness me, it’s a success. NoMa is the North May District and it’s a wonky little creation that stretches from Memorial Road to Hefner Road on May Avenue — historically one of the roughest roads in the city to drive. What should you eat at Hacienda? The list is long and messy. Grab napkins. The only thing I didn’t enjoy about the Molcajete DIY Guacamole ($9) was the DIY. I think it’s a cool idea to put a mortar and pestle full of avocados, veggies and seasonings in front of customers, but the reality isn’t quite as simple. Avocados are slippery creatures (they’re called nature’s tree eels for a reason) and gaining purchase on them isn’t always easy, especially in close quarters. Fresh from the skin, they’re slick and tend to squirm around inside the mortar as the pestle tries in vain to smash them into delicious paste. This is also a case where the keen senses of the kitchen staff might come in handy. Not every avocado is the same. Some will require more seasoning than others to make the guac truly memorable. Definitely order it and give it a try, but I’d like to see an option where it comes pre-smushed. UPDATE: Hacienda began scoring the avocados to make it easier for customers to smash them. God bless the Internet. The Mini Chimis ($7) are not a suggestion. They are mandatory. I don’t know if Hacienda can start charging a cover of $7 so that anybody who comes in gets an order, but they should. Originally billed as “truck stop burritos,” these glorious little fried bean burritos are exactly that. Bryan Neel grew up poor and his favorite treat was to walk to the nearby truck stop and buy something close to these flaky fried semi-Mexican delights. Stuffed with refried beans and chihuahua cheese, Mini Chimis are nigh addictive and absolutely essential. I wasn’t nearly so blown away by the Fiesta Queso ($4 small/$9 large) which has smoked bacon, chiles and chives. As a queso it’s fine, but with an ingredient list of smoked bacon, I was really hoping to taste the, y’know, smoked bacon. Get it if you want some tasty cheese dip, but don’t expect the whole hog, if you know what I mean. 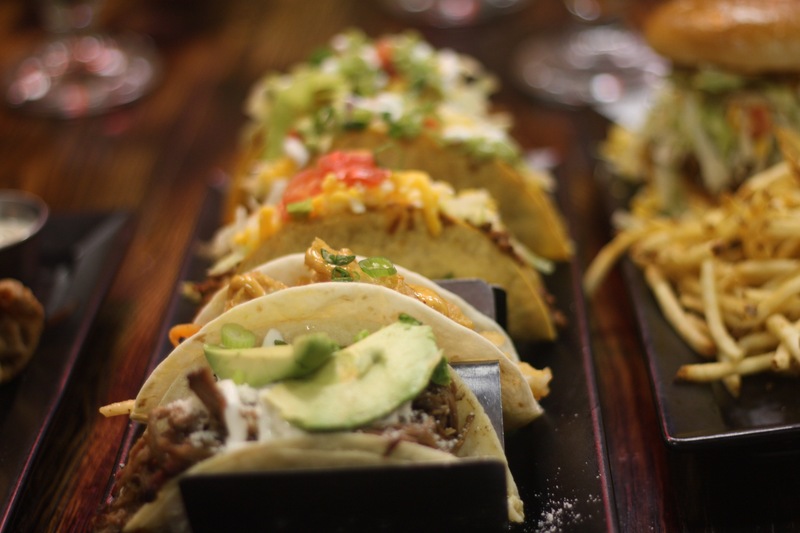 A great way to taste what Hacienda has to offer, the Street Taco Combo ($12) includes your choice of carnitas, chicken, al pastor or barbacoa tacos. Mix and match! Find the right one for your palate. Carnitas is the simplest and most straightforward — smoked pulled pork, onion, cilantro and cheese. For a taqueria-style taco, this is your best bet. Neel ought to consider opening a barbecue joint, because he’s got a handle on smoking meats. Al Pastor are filled with the same smoked pulled pork, but the inclusion of seared pineapple salsa (the heat caramelizes the sugar in the fruit and gives it a nice depth of flavor) covers up the taste of the pork. I love Barbacoa and the smoked brisket used at Hacienda is mighty good. Again, the only complaint comes from the accompanying ingredients. I GET IT. Hacienda isn’t meant to be a taqueria and I’m not trying to make it one. But sour cream and avocado, which I love, are such big, bold flavors that they overwrite the subtleties of the brisket. It’s a great taco, but I think I’d be just as happy or more if it was brisket, diced onions and cilantro. 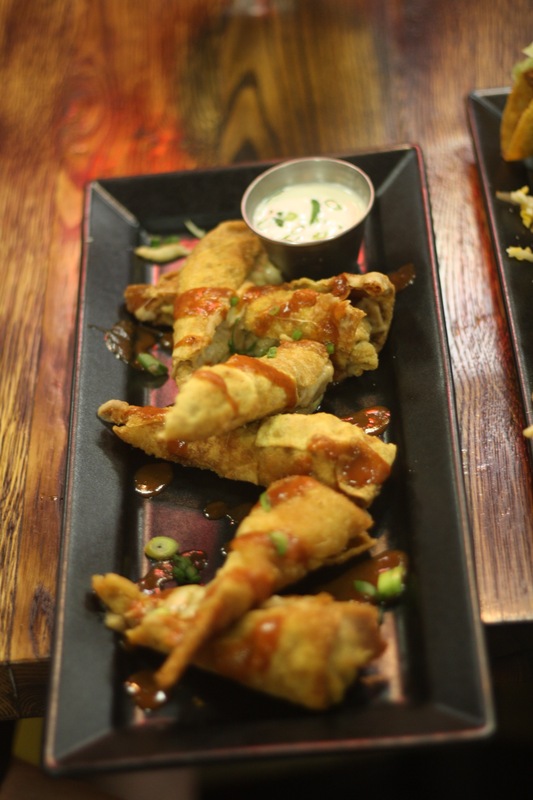 The Baja ($6) comes with either beer-battered shrimp or cod in a flour tortilla with jicama slaw, chipotle aioli and chives. I recommend the shrimp, which has more textural and flavorful pop than the cod. The Seared Ahi Tuna ($8) has a kimchi salsa that ought to be on every taco, frankly. Like many seafood tacos, these are very messy. 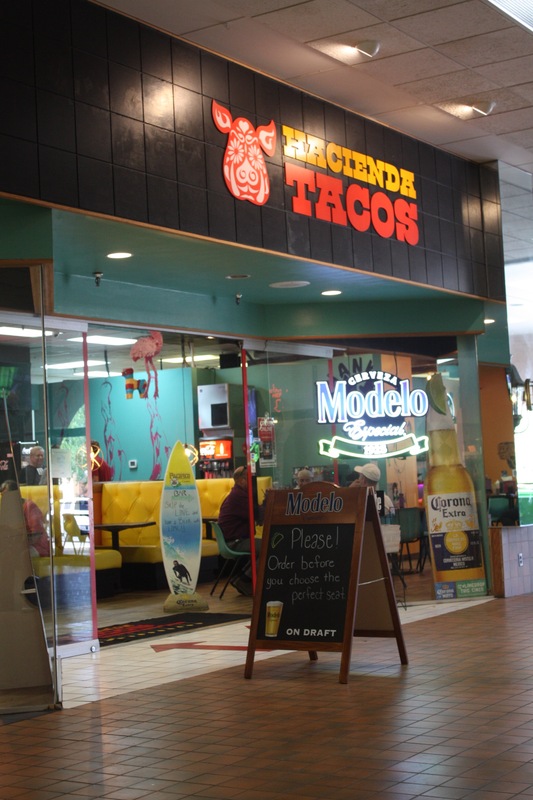 I’m prepared for some hate mail here (send to Greg@iateoklahoma.com), but my favorite taco is the Hacienda Taco ($3.5 plain/$4 supreme) that has a lot more in common with fast food tacos than you might expect. A quick guide to taco meat: while the tacos at Mssrs. T. Bell and T. Bueno might seem hopelessly inauthentic, they use a pretty standard cooking method called “picadillo.” From the Spanish “picar,” to mince or chop, picadillo uses chopped beef, spices, tomatoes, onions and broth to simmer and cook down to a flavorful, almost creamy filling. Granted, this is more a Cuban than traditionally Mexican dish, but it can be found across Latin America. Hacienda is putting on a masterclass in picadillo. Neel’s recipe uses tons of chipotle peppers to impart a sweet, smoky flavor on the meat. 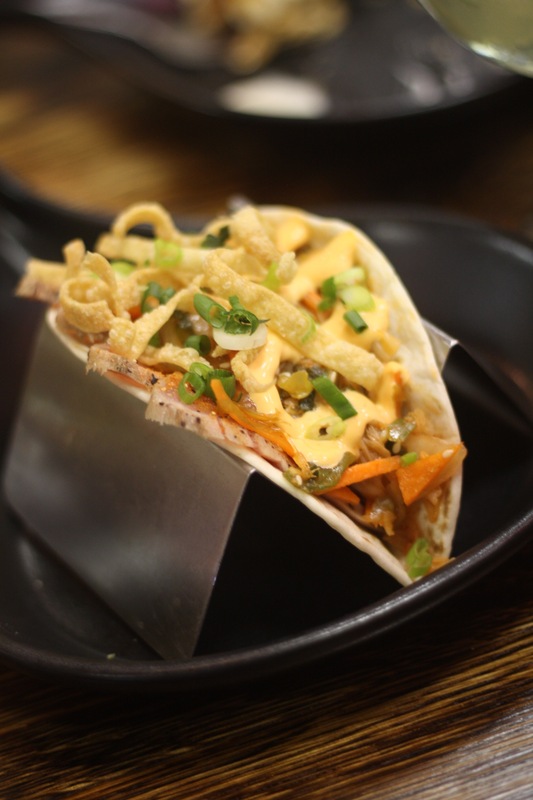 It may be slapped into the crispy taco shells with ease (Yes! Crispy taco shells are OK! Get over it! ), but the cooking method requires time and attention. Even less traditional, the picadillo can also be found in the utterly delicious Taco Burger ($10) with cheese, avocado, Sriracha aioli, lettuce, tomato and a brioche bun. While the brisket wilts beneath the pressure of added ingredients, picadillo has the brio to stand up to accompaniments. It also comes with shoestring french fries that, honestly, almost steal the show. Neel said they were keeping the prices the same but super-sizing the margaritas to fit those enormous chilled goblets that are so beloved at Mexican restaurants. Big and heavy enough to brain someone who has crossed you, these glasses hold a chill, which means your margarita will stay at the right temperature for longer. As a budget choice, Hacienda on Tap ($5.50) is a respectable margarita with tequila, lime and orange juice. But who drinks for respect? 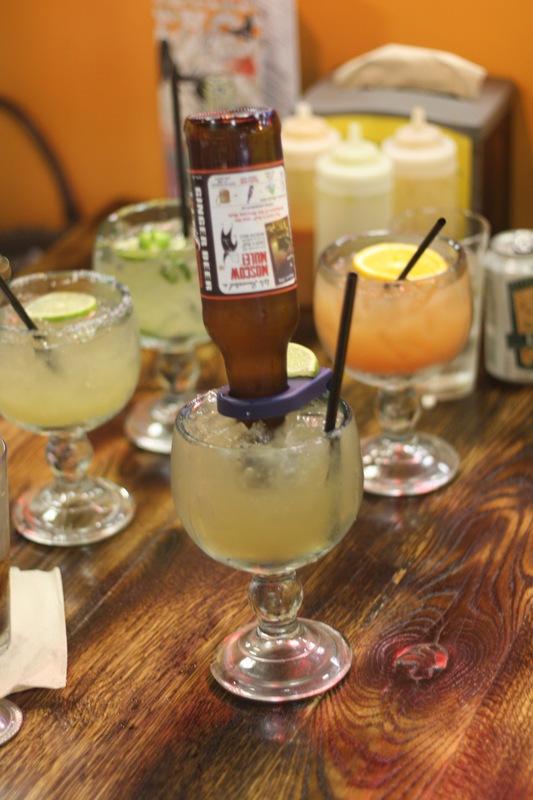 Get this as your second or third margarita (and call a friend to drive you home) and choose one of the more flavorful options as your starter. 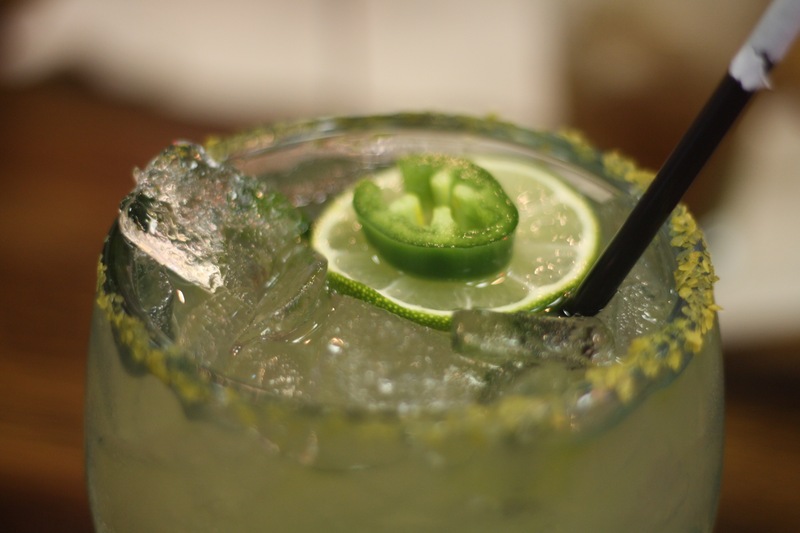 My choice is Jalapeno Business ($12) with tequila, muddled jalapenos, spicy simple syrup, lime juice and lemonade. Maybe it’s my long-simmering love affair with green peppers, but the jalapeno adds a dimension to this drink that I can’t quit. The prickly heat is subtle and builds slowly over several sips until you lean back and breathe fire. Want it hotter? Just ask! The sweetness of the juice and the syrup provide a nice balance for the heat and the tart lime keeps it refreshingly drinkable. For sheer poundability, a Blood Orange Sunrise ($9) can’t be beat. Basically a tequila screwdriver, this one goes down smooth and tastes amazing. While I’m not a passenger on the ginger train, I will give props to the Jalisco Mule ($10.50) with tequila, ginger beer and lime for being a bracing entry into the overstuffed Moscow Mule field. Go to Hacienda. Enjoy the tacos and the powerfully intoxicating beverages. Get that taco burger and make sure you bring a wet wipe. It’s one of my new favorite places to spend an afternoon in Oklahoma City. Mon.-Sat. 11 a.m.- 8 p.m.
Sun. 10:30 a.m.- 3 p.m.